Kranepool as No. 21? Maz as 12? Who can say what the genesis of fascination is? But if Mets uniform numbers — and the who and why of them — intrigue you, this book will scratch your itch. Mets by the Numbers is now available in bookstores throughout the tri-state area and on-line at amazon, Barnes & Noble, and others. Co-written with Matthew Silverman (Mets Essential, Meet the Mets), and with a dynamite foreword by Met broadcaster Howie Rose, Mets by the Numbers is based on the original research at this site. 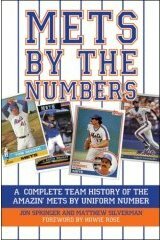 Unlike typical team histories that proceed chronologically, Mets by the Numbers is the first and only book that examines the team and its players by ascending uniform number, or from 1 (Mookie Wilson) to 99 (Turk Wendell). Included is a robust examination of each number and the players who wore them from the viewpoint of the fan, a deep dive into Met uniform history, daring acts of statistical acrobatics never before attempted, and more than 50 photographs courtesy of Topps. Why uniform numbers? In a sport obsessed with numbers -- creating, recording and analyzing statistics -- the uniform number may be the final frontier. It's not a stat that teams keep officially, and it won't score you any points in a rotisserie league, but it just might be the official statistic of the die-hard fan. For many, the association between player and number is a powerful one. The arrival of a new player recalls others who wore his number. Fans use numbers as mnenomics, adopt their favorite player's number as their own lucky numbers, plunk down $200 for a jersey with authentic digitry. It's the way the mind of a fan works. it's at once a valuable reference for the geeked-out Met fan and a must-have accessory for geek wannabes. Or as Bob Murphy might say, it's a marvelous addition to your baseball library. "Fascinating and entertaining ... a great companion during those interminable rain delays or pitching changes." "For those who enjoy reminiscing and lingering over the memories of the Mets at different periods in time. Mets By The Numbers is the perfect complement to any Mets library. Buy it for the avid Mets fan in your life." "Perhaps the most incredible repository of Mets data, Mets trivia and Mets Zeitgeist you will ever find between two covers." 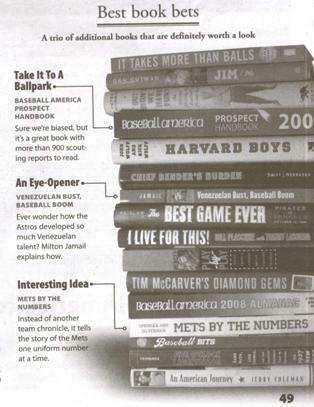 "Mets by the Numbers is a fun book that will delight any Mets fan." "Possibly the best book ever written." "Given the book's unique structure, it would have been very easy for each chapter to devolve into a tired roll-call, blandly cataloging every player to don a particular uniform. The authors deftly avoided that particular pratfall by interjecting humor with history, and leaving us with a chapter-long capsule for every number ever worn." "A must have for the Flushing team's fans." "The book, a spinoff of 'The Mets Website that counts,' tells the history of the crew from Flushing in a unique way: those who wore particular uniform numbers. Those uniforms can’t talk, but they’ve found their Homer and Virgil in Messrs. Springer and Silverman. "A good reference that should be on the shelf in every public library in the Tri-State area." "Interesting idea. ... the story of the Mets one number at a time." "A must read for anyone who’s lost sleep over a Willie Randolph move, a Doug Sisk pitch or an appearance by the immortal # 51, Mel Rojas. ... A fascinating way to dissect a team’s history and give it a fresh spin. Simply put, Mets by the Numbers is the best book I have ever read about my favorite sports team of all time." "Simply a must-have for Mets fans. I enjoy pulling it out at odd times and losing myself in its pleasures as I have done previously with the web site. I honestly can't think of a Mets-related book that I have enjoyed more."